the Superbpag Bamboo Collapsible Folding Bed Laptop Desk/Table/Stand with Drawer, currently 28% off on Amazon (as of 6/25/15). Advertisers make it possible for Digital Media Mom to bring you great content each day for free, so thanks for your support. Why Does Amazon Think I’m Interested In THAT? A site visitor recently wrote to ask how he could get rid of Amazon’s suggested products on his Fire tablet. Well, so far as I can tell it’s not possible to do away with recommendations entirely, but you can change them. Amazon keeps track of the stuff you look at on the site, and stores that list as your Browsing History. Your Browsing History is then used by Amazon’s site search algorithms to come up with product recommendations based on what you seem to be most interested in most recently. Your browsing history is also a handy feature for those times when you know you were looking at something on Amazon recently and want to go back to it, but can’t remember the exact product name. But what if you let a friend or family member, whose interests are FAR different from your own, use your computer or mobile device to browse Amazon while you’re still logged into the site? Amazon assumes it’s YOU, not your 10-year-old niece, looking at glitter nail polish, Bratz dolls and One Direction music. Suddenly your recommendations are a tween dream. If the person who borrowed your device was looking at things you or another household member might find objectionable or misleading, it can lead to not just embarrassment but some serious household drama. Imagine a friend browses a bunch of books on divorce and how to conduct a successful extramarital affair on your device, and your spouse is next to log in to the account! 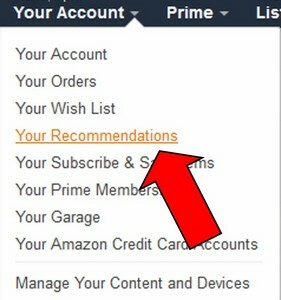 Fortunately, it’s easy to change the recommendations Amazon displays, by deleting items from your browsing history or telling Amazon’s recommendations engine not to use specific items in your browsing history. 3. Delete items from your browsing history on the Your Browsing History page. Note that you can filter your history by Category (blue arrow below) to zero in on specific items more quickly. Use the Delete this item link (red arrow below) to delete items. Remember to delete any items you’ve ordered as gifts and don’t want other household members to know about, too! Click or tap on the image below to view an enlarged version in a new tab or window. 4. Exclude items in your browsing history from recommendations on the Improve Your Recommendations page. Here again, there are filtering options (blue arrow below). Click the “Don’t use for recommendations box” (red arrow) to exclude a specific item from recommendations. Click or tap on the image below to view an enlarged version in a new tab or window. And that’s all there is to it. Use these instructions to improve your recommendations, avoid embarrassment and prevent sticky social situations! 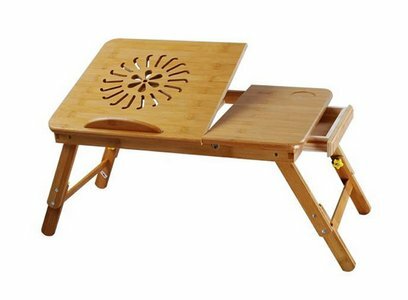 The Superbpag Bamboo Collapsible Folding Bed Laptop Desk/Table/Stand with Drawer is perfect for those times when you need or want to spend a few hours, or all day, in bed and want ready access to your laptop, tablet, book or anything else that requires a sturdy, flat surface that can be tilted to an adjustable angle. The table is even vented to help prevent laptop overheating. Right now this one is priced at just $35.99, which is 28% off its regular price of $49.99, and it’s eligible for Prime shipping too!